About a year ago, I went to Chicha for a company event and was subsequently left with fond memories of their delicious dishes. I finally made it back to this restaurant with my hubby and some great friends a few weeks ago. This absolutely fab restaurant has so many good reviews online, you might think why am I even bothering to write about this place again. It’s because this place is too good to not share with you. To be honest, I’ve never had Peruvian food before so I wouldn’t be able to tell you whether or not the food is authentic, but I could tell you for sure, the food is DELICIOUS. Most dishes on Chicha’s menu are designed to be shared, so this restaurant is ideal for a small group of friends looking to have a night of good food and company. When they first opened up, they were known to be the first Peruvian restaurant in Hong Kong, but, I believe this is no longer the case with Mayta popping up in LKF. 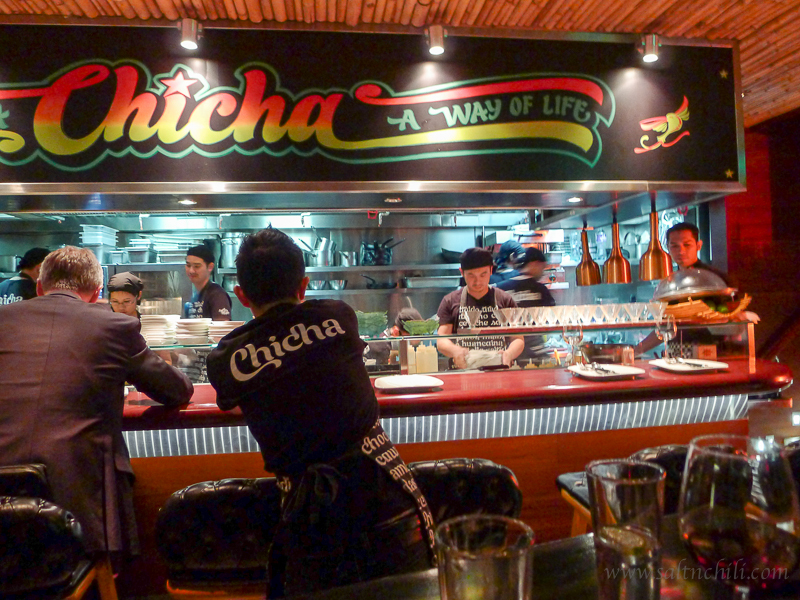 The decor of Chicha is both mysterious and sleek whilst exuding a vibrant energy. The space is split into 3 sections, the main dining section with long tables and leather benches, a smaller area with higher tables overlooking the kitchen and a cute little bar at the far end. The first time I went, I was seated in the dining section, which was great for a larger party. And this time we were seated at a table overlooking the busy kitchen, which I thought was ideal for our party of 4 for chatting. We started the dinner off with the Tuna Ceviche. All the ceviche dishes are marinated in leche de tigre, which is simply citrus juice (which is used to cook the raw fish). 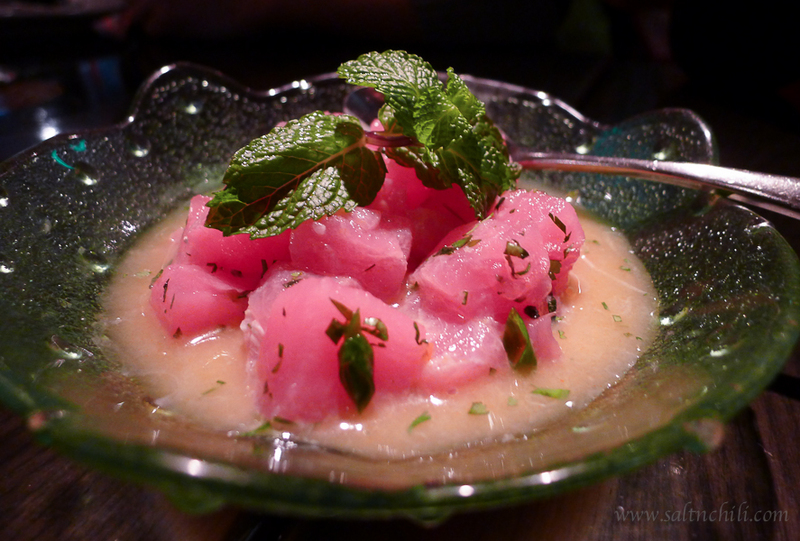 This particular ceviche was made with watermelon, basil, tarragon and orange leche de tigre. This dish was fresh and one of my favorites of the evening. My regret was not ordering the Trio of Ceviche which would allow us to sample the traditional Corvina which is sea bass and the Mixto which has a mix of seafood including shrimp, octopus and scallops. 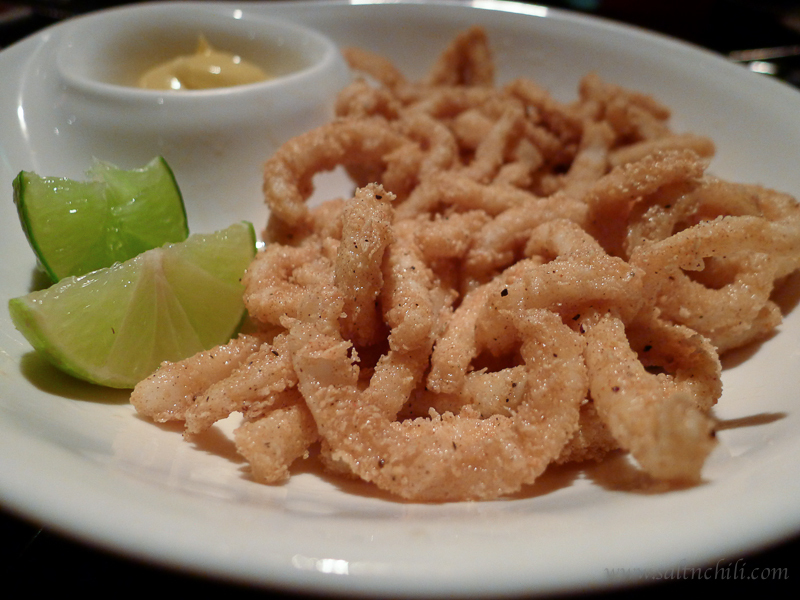 The Calamares Chicharrones was crispy and the rocoto aioli served with it, complimented the squid and was sooo addictive. This is definitely a great dish to share as a starter with friends. The Anticuchos, a typical Peurivian dish of grilled skewers, was the reason why I was dying to come back to this restaurant. 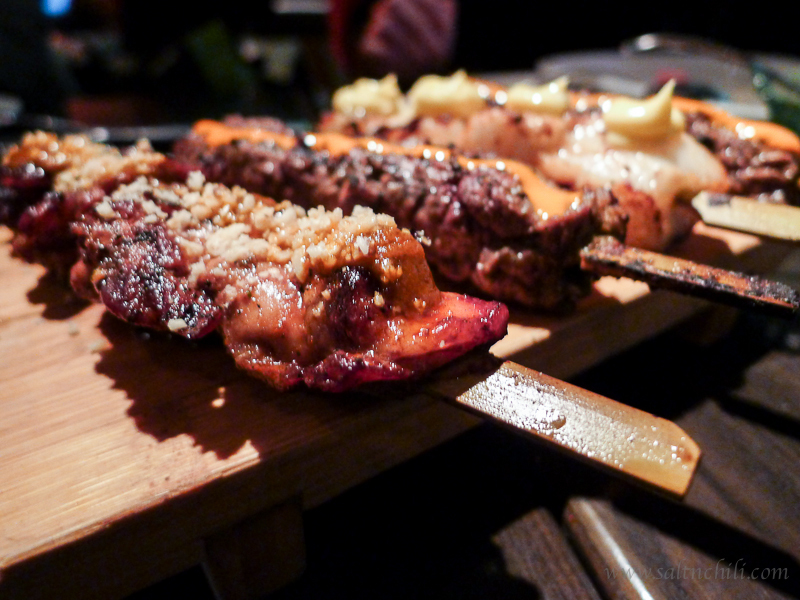 From the selection of skewers offered, we decided on Tenderloin (beef), Pollo (chicken) and the oh so amazing Oh My Cod (black cod). My favorite ~~ Oh My Cod, a grilled-to-perfection black cod with ponzo miso and aioli. One bite into this tender and smooth fish, you would understand how this skewer got its name. 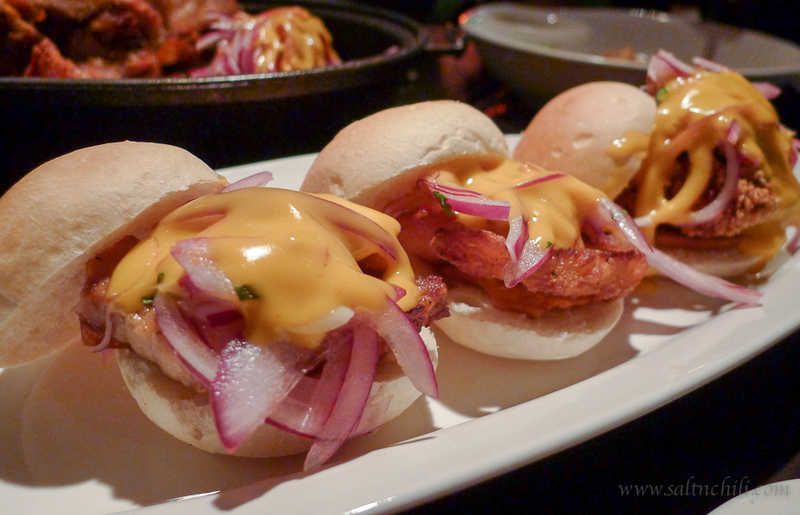 Next up was the Pan Con Chicharron, which looked like mini burgers overflowing with chunks of meat, salsa criola (which is a Peruvian red onion relish), sweet potato with a creamy aji amarillo sauce. We couldn’t help but to order all three meats, chicken, pork and fish. I would say the juicy pork was my fave. We ordered a taco platter of pork, chicken, fish and squid. I was lucky enough to snag the best taco, which was the fish. 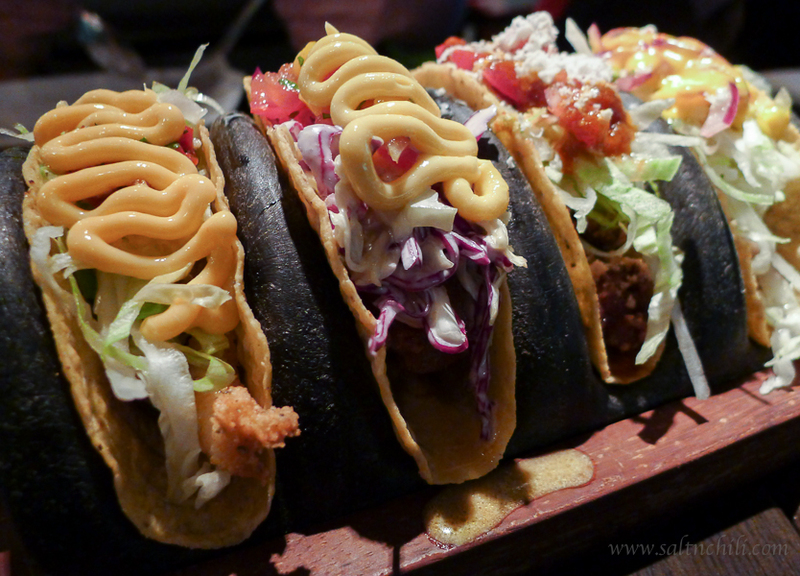 This taco was served in a hard taco shell filled with fish, mango salsa and a delicious, creamy aji rocoto sauce. 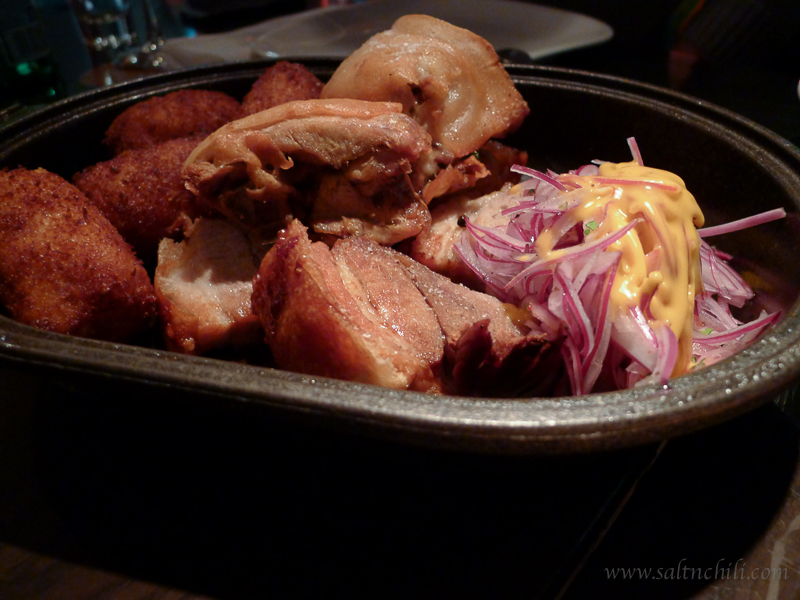 To ensure the men were full, our last was a Big Share dish ~ Lechon Al Horno. This suckling pig and pork belly were served with papas rellenas (which we learned from the waiter is a Peruvian potato tater stuffed with olives), ricoto maple sauce and the salsa criolla. This last meaty dish was a bit of a disappointment for me. I thought the suckling pig was too crispy (yes, there is such thing as too crispy) and a bit dry. As for drinks, I was feeling adventurous and tried one of their classic cocktails, the Jolly Roger (Pisco, Mixed Berries, Fresh Lime, Fresh Chili, Brut Millesime’, Up) . I was a bit reluctant at first, I questioned the harmony of berries and chili together, but I thought to myself…”what the heck, I love berries and I love chili, go for it!” This stunning red drink looked a bit thick as I watched the bartender pour it into the stylish cocktail glass. I took a sip, I was immediately hit by the spiciness of the chili but very soon left with the sweetness of the berries. I got to say, I’ve never tried any drink like the Jolly Roger…it was interesting, but I don’t think I will be ordering it again anytime soon. It isn’t easy to make reservations at Chicha, so Concept Creations have strategically opened a hip bar, The Roger Room, right across from its sister restaurant. I haven’t made my way to this establishment yet, but my friend told me that you can order dishes off of the Chicha menu and have it delivered from across the street. I’m not sure if it’s the entire menu you can order off of, or a selection of their signature dishes only. *This also includes some drinks and San Pellegrino’s. Enter your email address to follow this Hong Kong food blog and receive notifications of new posts by email.